I had the privilege as a seventh-grader to have an English teacher who encouraged his students to seek out poetry that moved them. One assignment from him was to write down a handful of favorites along with the reasons that we liked those particular poems. As this teacher understood that song lyrics were poetry that resonated with teens, my selections included several song lyrics — and far too revealing explanations on why those particular selections touched my naive heart. Mingled with those song lyrics, though, were a few real poems, the kind published in literary anthologies not blasted from Top 40 radio stations. 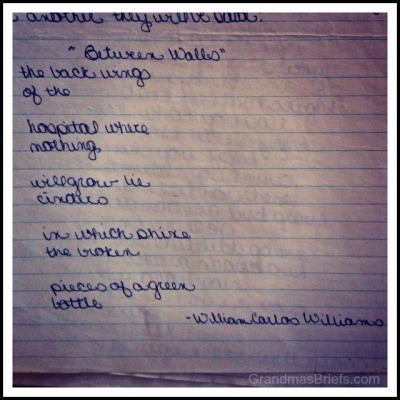 Despite that class assignment being decades and decades ago, I recall it because that teacher so successfully encouraged his students to appreciate poetry that I kept the assignment. In fact, I added to it at length throughout my junior high years, all in a binder emblazoned with my then-boyfriend's name. I still have that binder. Though the relationship with that boyfriend thankfully didn't last forever (hence the YUCK! scrawled across my beloved poetry collection), my relationship to many of the poems I wrote down all those years ago stands strong. On the binder pages, the ink remains bold, my teen handwriting vaguely familiar in those verses I transcribed for safekeeping. I share this because April is National Poetry Month. In celebration of the month, I recently received some lovely poetry books for kids of all ages from Candlewick Press, free for review. As I perused the pages of one of those books, Firefly July: A Year of Very Short Poems, selected by Paul B. Janeczko and illustrated by Melissa Sweet, a lump formed in my chest and goose bumps formed on my arms when I turned to page 30 and found — you guessed it — "Between Walls." The love I had for poetry as a teen had dimmed to a mere a flicker of late. 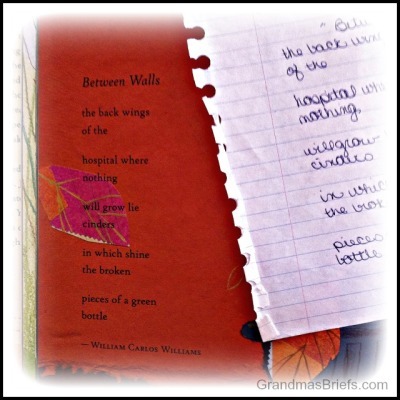 That flicker was fanned to a flame, though, upon seeing "Between Walls" in Firefly July. Finding it in this poetry book for kids proved that perhaps I wasn't so odd for appreciating that poem as a child after all. 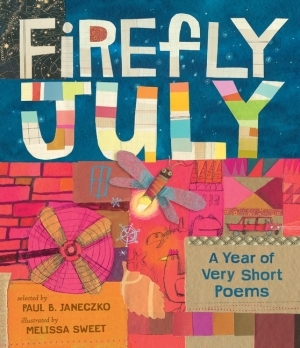 Firefly July: A Year of Very Short Poems, selected by Paul B. Janeczko and illustrated by Melissa Sweet ($16.99, ages 6-9) has many other equally beautiful, whimsical, amusing and — as the subtitle suggests — short poems kids and adults will enjoy. In addition to William Carlos Williams are poets such as Cynthia Pederson, Robert Frost, Charlotte Zolotow (another fave of mine), Langston Hughes and many more. The imagery of the text makes one's heart sing, the illustrations are magical. An excellent sampler of seasonal poetry. Though Firefly July definitely holds a special place in my heart, the three other books I received from Candlewick Press are equally perfect for igniting — or re-igniting — a love of poetry in kids of varying ages. 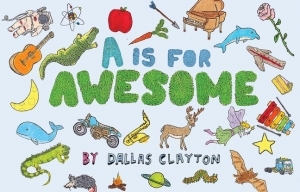 The youngest kiddos will get a kick out of A Is For Awesome by Dallas Clayton ($14.99, ages 3-7). This isn't a typical A is for Apple sort of book. It goes from A to Z as one might expect, but it highlights not only the letters but the magical, wonderful words that come from combining those letters together. As the book jacket notes, "Big words, small words, old words, new words — even words that no one has ever said before." They're happy words creating happy thoughts, all that a poetry book for the youngest poetry lovers should be. Each page has a phrase for the letter, accompanied by fun full-color fun. For example, "K is for kids being kids (that's the coolest)" shares the page with a koala, key and spilled Ketchup; the W page has "W for wisdom both spoken and written" along with a walrus, wagon, weights (and wrench) and more. This is a fun one to read with a youngster and have him or her name each of the objects. Fans of celebrated poet Emily Dickinson — long-time fans and new — will especially appreciate Miss Emily by Burleigh Mutén, illustrated by Matt Phelan ($15.99, ages 7-10). The book is based on actual events and relationships, told by MacGregor Jenkins, a young pastor's son who lived across the street from the Dickinson family. The book, told in verse and featuring graphite sketches, tells of the adventures Mac and his sister, Sally, had with their friends Ned and Mattie — whose aunt and next-door neighbor was Emily Dickinson. Ms. Dickinson was known to regularly enjoy outings and adventures with her nephew, niece and their friends. The book showcases a playful, mischievous side of the poet that few people knew. The most unusual and intriguing of those I received is Caminar by Skila Brown ($15.99, ages 10-14). 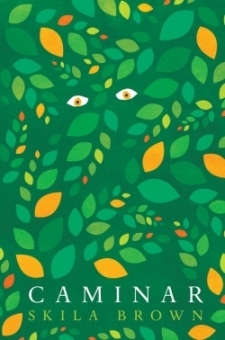 Caminar is a novel set in various sorts of verse — short, long, lyrical, shape poems and more — all from the viewpoint of Carlos, a boy learning what it means to be a man during Guatemala's Civil War in 1981. The moving book is based on real-life events. The dedication reads: "In memory of the more than 200,00 people who were killed or disappeared in Guatemala between 1960 and 1996. My they always be remembered." The poetry and powerful story of Caminar proves memorable. As Dallas Clayton writes in A Is For Awesome, "L is for living life up to its fullest." Poetry makes life all the more full, so pick a few poems to read with the kiddos who fill your life, in celebration of National Poetry Month. Disclosure: I received the books free for review; anecdotes and opinions are my own.